The Many Mini-Adventures of the Wards: The Dodgers WIN THE CHAMPIONSHIP!!! 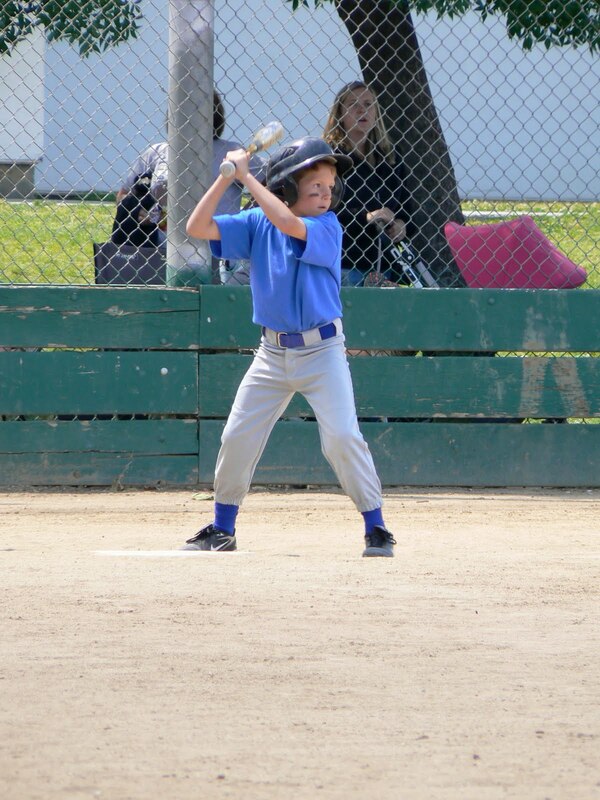 Logan played his last baseball game on his birthday. It was the championship game for the entire league. Whoever won this game would take 1st place for the 2010 season. Talk about pressure. To add even more pressure, it was also a well known fact that the opposing team liked to steal bases and the pitcher intentionally liked to hit the batters with the ball. There were so many obstacles to overcome to be able to play a good game. Logan was no exception. 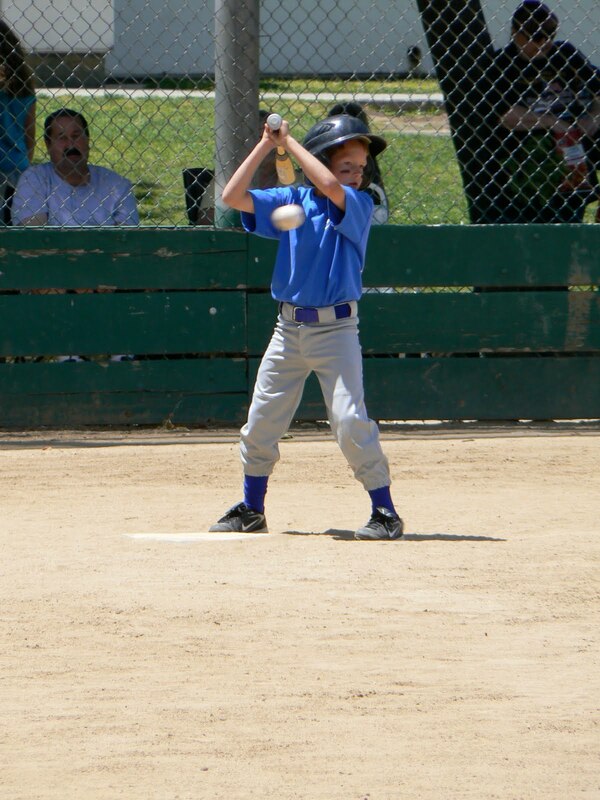 He feared getting hit by that ball every time he went up to bat. Logan's role on the team is #1 in the line up. First to bat. He was the one the team depended on to get a hit and get on base. It was his duty the entire season to be the man that got the ball rolling for scoring runs. 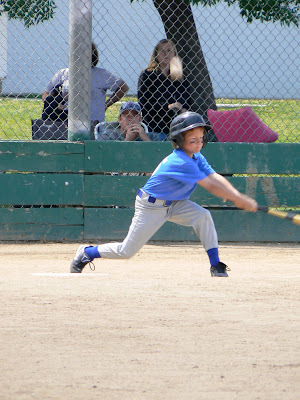 Check out his intense stance. Can you feel the nervousness? The heart pounding? The anticipation of a ball slapping into his leg? You can see he actually did hit the ball in the last picture here. It had just bounced off the ground and was coming back up at him. 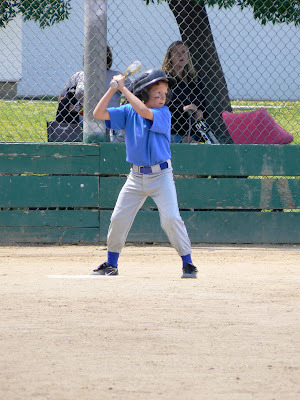 Logan made a great play while he was manning 3rd base and tagged a runner out! Woo hoo!!! He felt so good to be congratulated by his teammates and coach. There was a score. I have no idea what it was. All I know is that they won by 1 run. It was a quiet moment. I don't think most of the crowd knew it was actually the end. There was no great cheering. There wasn't a single, "nah, nah, nah, nah, nah, we-ee beat you!" The kids waited for the coach to give them the good news and then they dog piled the catcher. And that was it. Way to go Dodgers. You deserve some silly time. Get all those wiggles out after being so serious for 2 hours! At the team after party we learned a few things about our Dodgers... This team practiced more than any other team in the league. Most teams quit practicing as soon as the games began - no wonder we were so good! One other cool stat: our team made 55 runs this season (the most in the league). The next highest scoring team had 36 runs. WOW. Dodgers rock! Here are the coach's sweet sentiments about our Logan as a player on his team. There were some hard times - going to practice even when you didn't want to, wearing a cup for the first time, and making new friends. You pushed through all those challenges and actually ended up enjoying the time you spent playing baseball! Yes, it feels good to be #1 and be the greatest champions of all time. We would be proud of you even if you weren't on the winning team. It's your good attitude and perseverance that have made you such a strong boy and great team player. 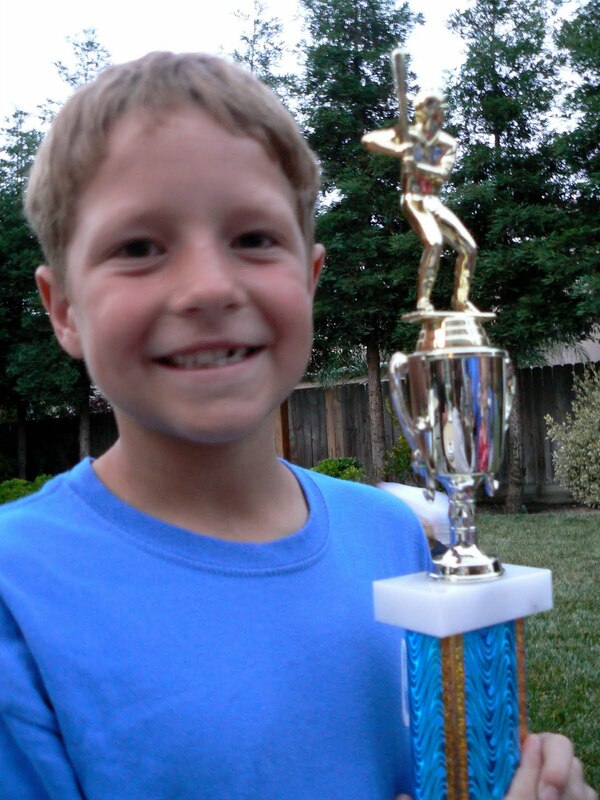 Logan, we love you and are so proud of you for doing your best this season.